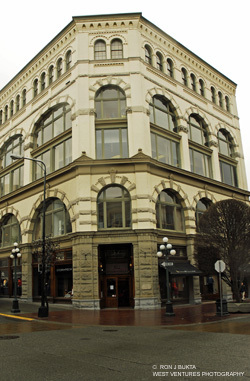 Victoria’s first department store and, at the time of its construction, one of the largest retail stores in Canada, was built for Weiler Brothers Home Furnishings. John Weiler came to Victoria from California in 1862 and established a furniture manufacturing business in which quality was the byword. Each of Weiler’s four sons was responsible for different functions of the business. The new building boasted 109,000 square feet of well lit display and storage areas that were serviced by two elevators. Construction of the interior was an engineering feat which utilised a massive post and beam interior frame within a brick shell. Other features included ground floor windows floodlit at night, moulded interior ceilings, native wood wainscotting and fire hydrants on each floor. Weiler’s had a reputation for fine imports including the Liberty of London line, Voysey and Morris-designed carpets, and Turkish and Indian rugs. George Straith Ltd., retailers of fine clothing, occupied the building from the 1940s. The building has been well maintained over the years and remains a landmark retail presence on Government Street.